The Esther Honey Foundation established and continued to support the Cook Islands’ only veterinary clinic for thousands of companion animals from 1995-2018. The Esther Honey Foundation Home Office recruited more than 500 veterinarians and thousands of technologists/vet nurses, interns and animal advocates to travel to the South Pacific to treat 2,000 – 3,000 animals annually. Services were provided in return for donations. Note: EHF’s patients are primarily companion animals, but our veterinary teams have also treated pigs, goats, horses, birds, fruit bats, one seal and a hawksbill turtle. All volunteers work under the auspices and at the direction of the US office and the EHF Board of Directors and are required to adhere to clinic policies and protocols established by the Esther Honey Foundation in compliance and in agreement with Host Islands authorities. 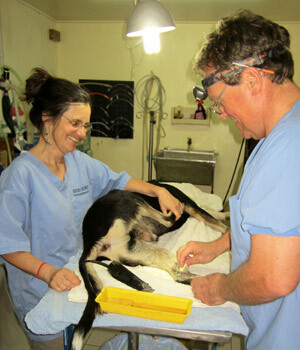 It is expected that experienced veterinarians will supervise vet students and recent graduates. All volunteers with the the exception of senior veterinarians share in the maintenance of the animals, clinic and EHF residence. All volunteers, particularly veterinarian volunteers, are expected to remain on-site during the time that they are scheduled to work at the clinic unless prior arrangements are made.